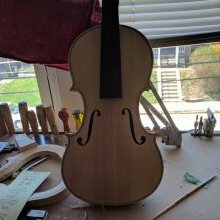 I am making a larger violin that will have a back length of 356 and wide upper bouts. I usually stick around 352 but I want to try it. 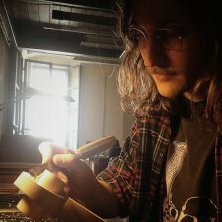 I have heard of many successes and failures with making larger instruments but I am curious if there are suggestions from the experienced in regards to wood choice and arching when making a larger violin. Thanks. 4mm difference is just over 1%. Do as you would do as for a smaller vn. 356 isn't really a "large" violin. That's a measly 0.28% difference in a standard violin body length. I'd call a 352 on the small side and a 356 pretty standard. Large is 360+ in my book. For example Golden period Strad lengths 363-364mm I would consider long. The drawback at this length or longer—you will have difficulties finding a case to fit the instrument. Your 356mm is within the normal range. Look at Maggini's They are big violins. Small correction here: 363-364mmm is the length of long pattern Strads, most of them made before 1700. Golden period Strads have actually the length you are intending to use. Long pattern strad used to be little longer than violins built on P/PG/G mould. But as the cc bout width is the same, upper and lower bout are more narrow on Forma B. According to the measurements taken by Pollens, upper bout is 154mm instead of 161mm and lower bout is 194.5mm instead of 200/201mm. Using the G mould in its original size, you're gonna get a violin 357 mm long or even more. That would be my answer too as to what is large and what is not. My usual models have been a 357 Strad and 355 enlarged GdG, and recently a smaller 353 Strad P form. As to what wood choice and arching to use... naturally the larger body would want higher arching, if only from scaling up. My preference is 15.5 - 16 mm for the top, and a bit less for the back. For wood, I would use lower density (under .40 spruce, with good stiffness) wood in order to keep from getting too heavy and sluggish. I think you can get away with higher density stuff on the smaller sizes.